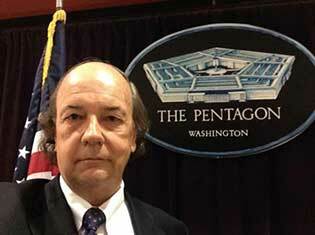 Hi, my name is Jim Rickards. In the next 60 seconds I’m going to show you an urgent letter I’ve just written to President Trump. In the late 1990s, for example, I worked with members of the Federal Reserve bank to save America from a $1.3 trillion banking crisis. It would have imploded the US economy. But thanks to my work, it never happened. After 9/11, I started working with senior military leaders at the Pentagon and the highest ranks of the CIA. And helped them develop a financial model to predict the next 9/11… by analyzing unusual activity in airline stocks. A few years later, in 2007, I delivered a message to the US Treasury. Warning them the housing collapse was about to get a whole lot worse. You now have a small retirement window. Take the right steps, and you could secure a comfortable retirement in 2018. I’m afraid you’ll NEVER be able to retire comfortably. When I predicted the mortgage crisis, for example, nobody believed me either. Unfortunately, everyone in Washington thought such a systemic collapse was impossible. And markets crashed across the globe, wiping out $10.2 trillion of wealth. Those who ignored my warnings lost everything. More recently, I predicted that the UK would vote to leave the European Union (the so-called Brexit). Nobody believed that could happen. Once again, those who ignored me were caught completely off guard. This has all been caught on camera, by the way. I’d bet 99.9% of investors lost money that day. But a small group of folks who read my research actually had a chance to make 57% in a matter of days. Imagine if that happens to you! For most people, it would take years to see those kinds of gains. Even if the markets are collapsing and most people are losing money. Something similar happened when I predicted Trump’s victory on live TV. The so-called experts were giving Hillary a 98% chance of winning right up until election night. So to say my prediction was controversial is a huge understatement. You can actually see how my prediction shocked the TV anchors in the 1-minute clip below. I’m not telling you all this to brag. Or condemn you to spend your “golden years” struggling to pay for food, medicine and even the most basic necessities. Again, it all depends on how you act in the next days. I also think it’s important you realize my predictions are not just “educated” guesses. They’re based on VERIFIED facts! Facts that are normally ignored by the “fake news” mainstream media. The plan you’re about to see, for example, has even been confirmed by members of the global elite. It’s a brand-new worldwide banking system called Distributed Ledger Technology. And any cash you have parked in the US financial system. Unfortunately, Trump CANNOT stop this. There will be nothing the White House can do. They have no direct control over the institutions that will carry this out. 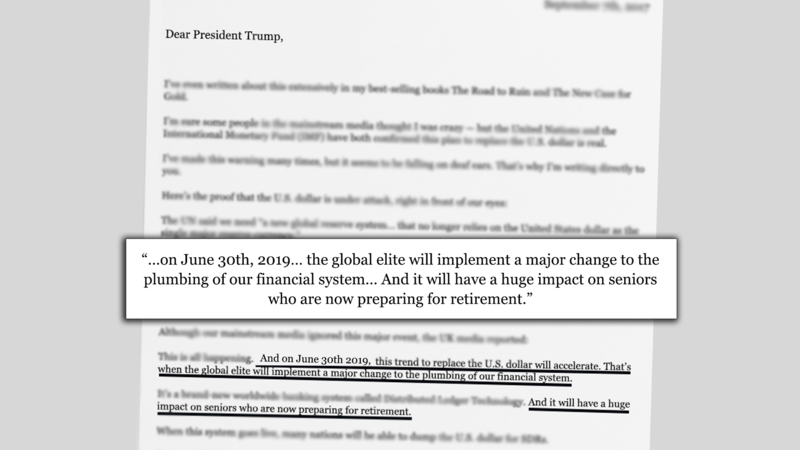 The global elites’ plan is in motion… and my research indicates this new system will be rolled out as early as June 30th. ***Under the guidance of the International Monetary Fund (IMF), global elites will use that new financial system to replace the US dollar with their own globalist currency. This new currency will be off limits to everyday folks. But I found a “loophole” that allows you to take a direct stake on this new globalist currency. And come June 30th, this currency could explode higher… making you a small fortune. I’ll show you this incredible opportunity in just a moment. ***With the globalist currency replacing the dollar, demand for Treasury bonds will dry up… cutting the US government’s main source of funding. We’ll see major disruptions in welfare programs, such as Social Security and Medicare. Those who depend exclusively on Social Security will be out of luck… and will watch their checks get cut in half… or worse. Regardless of what happens to Social Security. And no, this has nothing to do with dividend stocks, bonds, REITs, selling puts or any other income strategy you might have heard before. ***This event coming as soon as June 30th could also set up a huge opportunity in the stock market. If you target the right moves, you could walk away wealthier than ever before. Using a trade opportunity most people don’t even know is possible. Of course, you won’t hear any of this from the “fake news” mainstream media. But the IMF, which is coordinating this entire thing, has even issued a memo. Look, for years the global elites have been quietly laying the groundwork to replace the US dollar with their own globalist currency. They finally have everything they need to EXECUTE their plan. I realize most people have never heard of this new global banking system. But thanks to my network, I’m privy to the details of this plan. 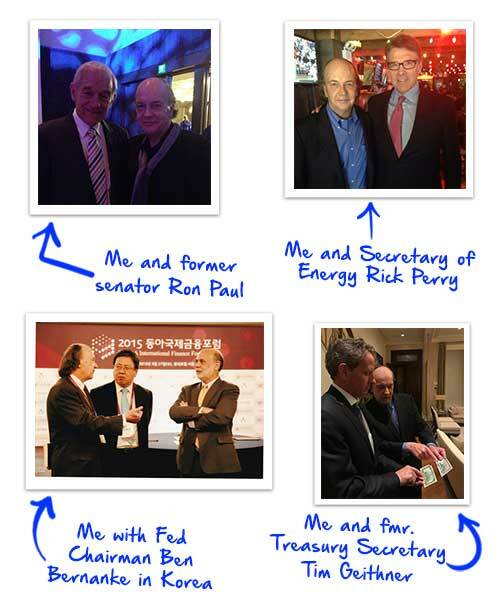 From former congressmen, like Ron Paul… to heads of central banks, like Ben Bernanke… to US Treasury officials… foreign ministers… all the way to the White House. For example, I PERSONALLY know the head of the Distributed Ledger lobbying group. I’ve gathered internal documents that PROVE global elites are preparing to use this new financial system. The IMF has even set up a special task force. And they’ve been meeting behind closed doors to discuss the details. Their intentions couldn’t be clearer. And now that Trump is in power, they’re ready to pull the trigger! It’s no secret the global elites hate President Trump. His nationalistic agenda is the exact opposite of the globalists’ hidden agenda of world government, world money and world taxation. He believes in immigration control, not open borders. And defied global elites by pulling out of their Paris climate accord. Put simply, Trump is a major threat to the global elites’ agenda. And now they have the perfect plan to stop him. And blame all the chaos on Trump. In fact, the “fake news” mainstream media already started to lay the groundwork for blaming Trump. Even The Wall Street Journal is playing the blame game. The Journal actually quoted me in that specific article. As you’re about to see, the global elites have been working on this plan to dethrone the dollar for years. It just so happens now they have the perfect scapegoat to execute their plan. You see, many economists thought our massive government debt would trigger a dollar crisis. But they’ve been proven wrong again, again and again. And yet, nothing has happened to the US dollar? The US dollar remains the world’s reserve currency. That means other nations have to hold and use the US dollar for international trade, instead of their own currencies. And it allows us to print trillions of dollars each year to pay for wars, debt and anything we want. Basically, it’s a license to print money and abuse the global system. And that’s why we’ve been able to accumulate more than $19 trillion in debt without suffering any consequences. As long as there’s no alternative to the US dollar, we can keep doing that forever. Look, our nation had an amazing run with the US dollar as the #1 reserve currency. We were able to build a true empire with seemingly unlimited control of the world. But that’s precisely why global elites are sick of the US dollar. While they actually have to pony up $100 of actual goods in order to obtain the same bill? And now they’re finally taking action to “fix” this problem. For years, they’ve been working on a plan to replace the US dollar with their own globalist currency. What’s different this time is… they finally have the tool they need to execute their plan. Telling Americans that the financial global elite was planning to issue their own globalist currency called SDRs. And that they would use this new currency to REPLACE the US dollar as the global reserve currency. But the United Nations and the IMF have both CONFIRMED this plan to replace the US dollar is real. More recently, they advanced their plan by helping private institutions, such as the UK’s Standard Chartered Bank, issue bonds in SDRs. That’s why I’m saying you should get in before June 30. And many other nations will be able to dump the US dollar for SDRs. Look, you don’t need to be an economist to connect the dots here. Fact #1 — The IMF issues a globalist currency called SDRs. Fact #2 — The IMF has confirmed they want to replace the US dollar with SDRs. 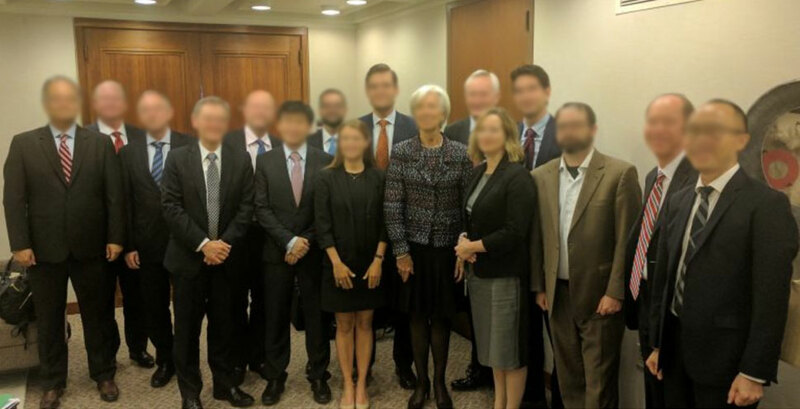 Fact #3 — The IMF has confirmed Distributed Ledgers can be used for “currency substitution”… and they’ve even set up a special task force. Why do you think they’re so interested in Distributed Ledgers? The IMF wouldn't be looking at this technology to create a dollar payment system. They'd be looking at it to create an SDR payment system, because that's the currency they issue. See that woman at the center? That’s Christine Lagarde, head of the IMF. Barbara C., a former US Treasury Department attaché to the European Union, has reached the same conclusion. The IMF is planning to use Distributed Ledgers to replace the US dollar with SDRs. SDRs will NOT be available to everyday folks like you. It’s not something you can have in your wallet. Instead, you’ll be left with devalued dollars. But I found a “loophole” that allows you to take a stake in this exciting new currency. That means if you’re older than 60, you only have a few days to prepare. Once this plan goes live, I’m afraid you’ll no longer be able to retire comfortably. They will no longer need to hold dollars. And that will have a DIRECT impact on welfare programs, such as Social Security and Medicare. We pay them in US dollars. And what do they do with that money? They can’t use it in their own economies. So most of them invest in Treasury bonds. By issuing Treasury bonds to other nations. Once Distributed Ledgers go live, other nations will no longer need to buy Treasury bonds. And that means our government will no longer be able to finance its normal operations, including welfare programs. I showed you how some private banks have already started to issue SDR bonds. And YOUR Social Security and Medicare. That’s why this new financial system could have a HUGE impact on seniors who depend on Social Security income to live. Imagine watching your Social Security check getting cut from $2,000 to $1,000! Because the weakest companies in the stock market could collapse once this plan goes live. Just look what happened the last time we had a big change in our global financial system. In 1971 Nixon announced the US would no longer officially trade dollars for gold. 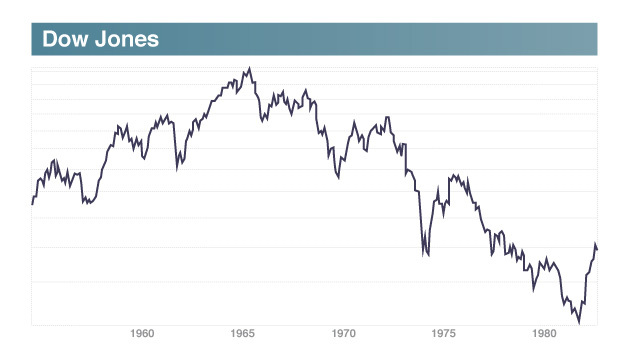 That created a lot of uncertainties, turning that decade into a nightmare for stock investors. Take a look… the Dow Jones, an index of “stable” blue chip stocks (the kind most retirees like to hold), was cut in half! Stock investors bailed out of the market and, for the most part, didn't come back for a decade. Because the transition from a US dollar system to a new system dominated by SDRs will be messy. Stocks will collapse… and will stay down. There will be no recovery this time. Because the US government won’t be able to come to the rescue, like they did in 2008. Let alone to save stock investors. If you target the weakest companies out there, you could come out on the other side wealthier than ever. In just a moment, I’m going to lay out a 3-step plan to help you secure a comfortable retirement. And that means they must pass through the US banking system’s network. This gives the US government an incredible amount of power. They can not only see all the transactions, but stop, trace or freeze them. For example, in 2014 the Obama administration fined French bank BNP Paribas $9 billion because they did business with Cuba and Iran. The bank didn’t break any French laws. But the US government threatened to kick them out of the US banking system if they didn’t pay the fee. Being kicked out of the US banking system is like a death sentence. International financial institutions must be able to clear and settle US dollar transactions if they want to remain in business. That’s why French bank BNP Paribas paid the fee. Something similar happened with Britain’s Standard Chartered Bank, Germany’s Commerzbank and Switzerland’s UBS, among others. Use That Network to Settle Their Transactions in SDRs, Instead of the US Dollar? That’s exactly what Distributed Ledger technology is all about. It’s a new financial technology to clear and settle international financial transactions. With this distributed system, America will no longer have a stranglehold over the world’s international finance system. And transfer funds across international borders without using America’s payment system. But they didn’t have the infrastructure necessary to make that happen. They didn’t have a decentralized payment system that could facilitate wide adoption of SDRs. With a Distributed Ledger, it will be much easier for other nations to dump the US dollar and replace it with SDRs. Countries like China and Russia will be able to invest in SDR bonds… and the US government will never know. It’s totally outside America’s control. And because it’s a Distributed Ledger, there’s no choke point we can control. That means we can’t stop it. Remember, this is all part of the global elites’ agenda of world government, world money, and world taxation. Because they know replacing the US dollar with their globalist currency is the ultimate way to transfer power from the US to the global elites. Your dollars in your wallet or bank account won’t disappear from circulation. That new globalist currency will NOT trickle down to you and me. It will remain at the top of the system, in the vaults of central banks, monetary agencies and global corporations. You won’t have SDRs in your wallet. Instead, we'll be left with near worthless dollars for everyday transactions. The dollar will become just a local currency… no different than the Mexican peso. The US dollar will be good only in America. They won’t be good anywhere else because other nations will NOT need them. Since they will be using SDRs instead. Because we’ll see major disruptions in welfare programs like Social Security and Medicare. But there’s no reason you have to join them. Even when almost everyone else’s is crashing around you. Betting on currencies during political events is one of the quickest ways to make a fortune. Investors who bet against the British pound made a fortune. Crispin O., a hedge fund tycoon, made more than $268 million. Thomas S., another hedge fund manager, pocketed $120 million in one day. He made a cool $1 billion in one day. First, they required complicated transactions in the forex market. And second, they were extremely hard to predict. Which is why I’m so excited with today’s opportunity. I found a “loophole” that allows you to own an “unofficial” stake in the future world reserve currency. And it doesn’t require a lot of money to get started. That means anyone can open this trade. This trade is totally predictable. Because I fully expect this plan to go live on as soon as June 30, 2019. It may be earlier or later… but I am anticipating this happens mid year 2019. The globalist currency will NOT trickle down to everyday folks like you and me. It will stay at the top… and it will be exclusive to the financial elite ONLY. The few who have access to it could make an incredible fortune. And I happen to have the only private link in the world that will get you in. You’ll find this link inside a private intelligence dossier called The Only Way to Own the New World Money. I’d like to send you a copy, free of charge. Inside it shows you exactly how this works. It’s a little-known kind of account that gives you an advance stake in the rise of “new money” bank reserves. And it’s the only way I know of for any private citizen to get access to the globalist currency. And you can do it right now… before a Distributed Ledger goes live. Because I’m afraid after June 30, it will be too late. Members of the global elite will pile up in this new currency, pushing its price way higher. All you need is the private web link that gets you started. Only a tiny number of people in the world happen to have it. I’m one of them. I don’t get a commission or anything for sharing it with you. Even still, I’ll show you exactly how to set up this special “world money” account, for maximum exposure to any gains. After that, you can rebalance your assets in this account however and whenever you see fit. There are no money managers involved. You’ll have complete control of this special account. And I’ll have the complete satisfaction of knowing you’re ready to preserve your wealth — and possibly collect a fat double-digit return — ahead of the “world money” deadline. Because every American citizen deserves to get a piece of what could be a really explosive currency move. I’ll give this private link to you… and explain how to use it… in your free copy of this intelligence dossier, The Only Way to Own the New World Money. I saw the collapse coming a mile away. In a 2005 presentation at Northwestern University’s Kellogg School, I warned the audience a new financial catastrophe was coming. 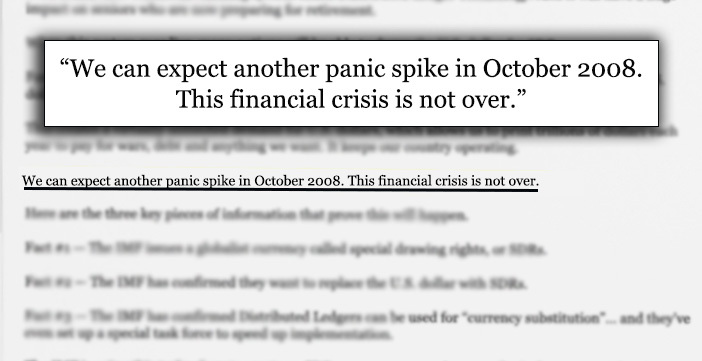 In late 2007, I told a US Treasury official that what we were watching at the time was just the beginning of a systemic collapse. Unfortunately, three weeks later I was proven right. While most investors lost everything, it didn’t have to be that way. Because if you had placed one single trade, you could have actually walked away with a small fortune. The victims who do nothing and lose everything. And the vultures who see what’s coming, and use the crash to profit. In my own career, I’ve used this system to pocket gains as high as 3,000% when shares of telecommunications giant WorldCom collapsed. You can do the same by targeting the weakest companies in the market. Take a look at what happened with company OSI Systems in 2008. It lost more than half of its value in a little more than two months. 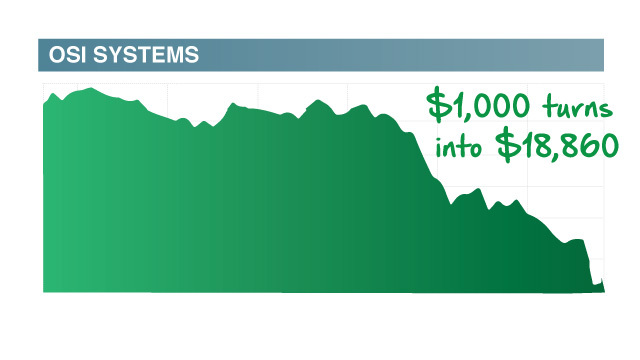 Had you placed one simple trade, you could have turned that crash into a 1,786% gain. Enough to turn $1,000 into $18,860. All in a little more than two months. 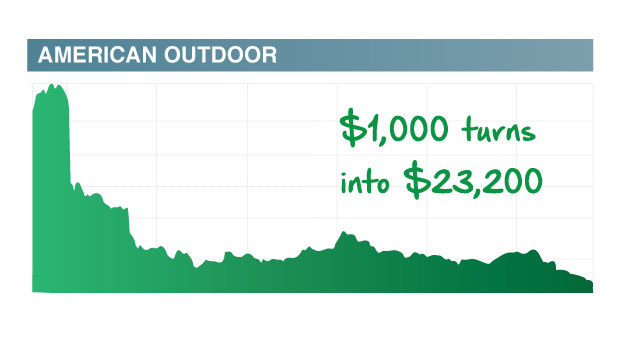 Or look at American Outdoor Brands Corp.
Its investors were ruined when shares crashed 86% in 2008. 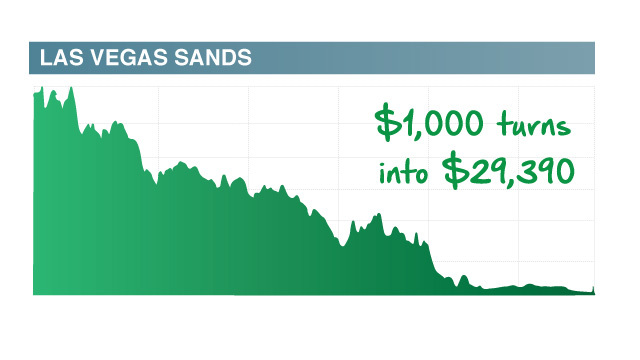 But with one simple trade, you could have turned $1,000 into $23,200. Invest $5,000, and now you’re looking at a payout of $116,000! Or look at giant casino operator Las Vegas Sands. Shares were trading at nearly $150 at the time. But with all the turmoil in 2008, shares dropped all the way to $1.50. The company almost went bankrupt. Can you see now how easy this can be? Targeting weak companies during a crash is the quickest and most predictable way of making a fortune. And to help you get started, my team and I have already done all the homework for you. We’ve identified three companies you can target right now by placing a simple trade. You’ll find all the details on how to profit from these three companies inside your FREE report How to Turn $10,000 Into a $193,500 Fortune. As I mentioned before, once the global elites’ plan goes live, it could have a huge impact on American seniors. I fully expect to see major disruptions in the Social Security program. Which is why it’s important you find other sources of income. Those who rely exclusively on Social Security will almost certainly end up on the breadlines. You won’t have to be one of them. Because I’ve found a unique way you could generate as much as $1,000 or more every month… almost effortlessly. But wouldn’t you like to have $1,000 deposited into your account every month? You can get started with as little as $5.50… with a click of a mouse. Because you can get started directly from your retirement account. And once you “sign up,” you’ll watch that cash get deposited in your account every month. You could be getting $1,000 or more deposited into your account. 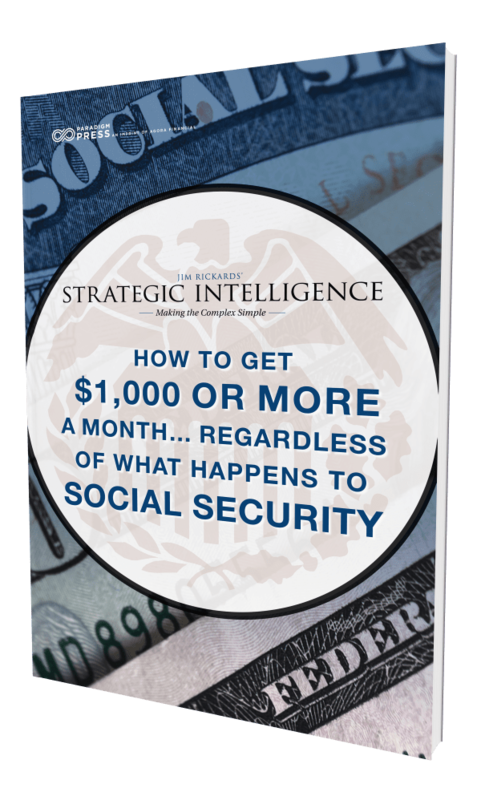 I’ve put all the details inside another intelligence report called How to Get $1,000 or More a Month… Regardless of What Happens to Social Security. Just keep in mind there is no such thing as a risk-free investment. And that past performance is no guarantee of future return. Altogether that gives you three powerful ways to protect yourself. And the chance to get $1,000 every month, regardless of what happens to Social Security. And all before June 30th. That’s a lot of my best research. I’m offering to give it to you right now, for free. No questions asked and yours to keep. Those venues don’t allow me to share the most sensitive moneymaking moves with regular folks like you. After June 30th, 2019, I’m afraid those who don’t prepare will never be able to retire comfortably. The retirement window will slam shut forever. Recommending to you where to invest and how to avoid the pitfalls. That’s why I’m inviting you to take a risk-free trial of Jim Rickards’ Strategic Intelligence. To help everyday folks profit from “unthinkable” events and financial crisis. Until now, I have only provided this kind of service to my high-net-worth clients and members of the US intelligence community. This letter will not be available anywhere else in the world, at any price. I’ll send you everything I mentioned today… FREE of charge. As soon as you claim this FREE package, you’ll also gain access to my Strategic Intelligence Video Series. It’s a 10-part welcome series of videos where I answer all the questions you need to know to get up to speed. Think of it like a “fast track” introduction course you can watch even before you start reading my letter and intelligence reports. No matter what happens with our economy. “Thank you so much for all of the investment advice you have provided in Strategic Intelligence. I have found that your analysis of the economy and your investment advice stand head and shoulders above the rest.” Geoffrey C.
“I can sleep better at night knowing when the s*** hits the fan, I will be making money and not one of the people scrambling to make it day to day.” Patrick N.
“There are only a couple of analysts I follow who really understand what’s happening and Jim Rickards is at the top of that list. He’s the most intelligent and connected person I have access to. I look forward to each [issue] and find myself in awe of almost every word.” Ken D.
“I have recommended Strategic Intelligence to my friends and family because it’s information everyone should know about. It’s worth its weight in gold.” Bill P.
“Just one minute of time listening to Jim would convince anybody to sign up for his incredible insight.” Todd W.
“Jim is without question the best financial mind I've ever heard. His analysis is complete and, most importantly, understandable. It's all original, substantive information. In short, I think he is top-notch.” Rodney S.
“I am more secure knowing that someone much more experienced and intelligent than me recognizes just how thin the ice is... the Fed, debt, deflation, inflation, the dollar, etc., and yet offers hope in preparing for the inevitable. I have taken advantage of several recommendations and recently profited nicely from the DXJ play.” John B. “His analysis of world events has been spot on and diametrically opposite to what you see in the major media outlets.” Isaac J. “He is one of the few experts around that I don't walk away feeling there was hidden agenda. I truly believe he simply wants people to prepare for what’s in front of us.” David C.
“Very concrete financial information. The investments Jim recommends are proven winners that increase over time even in this economic malaise we find ourselves in. I feel Jim would not recommend anything that he would not invest in himself. His track record speaks for itself.” Veronica J. “I have benefited from Strategic Intelligence beyond my imagination. The information Jim Rickards provides is like none I have read anywhere.” Brad O. “The recommendations are perfect and spot on!” Susan S.
“You get an insider's perspective, you get to know what the elites are doing so you can protect yourself just like the families who have kept wealth for generations. And he makes the complex financial inner workings of central banks, governments, hedge funds, and financial institutions incredibly simple to understand. We now have the tools we need to stay ahead of the game.” Chris C.
“I am impressed with Jim's network of contacts among the leaders in the banking world as well as the intelligence community. I'm grateful that he has decided to help those of us who don't have that kind of network to understand what’s really going on behind the scenes.” Paul A.
I’m happy that my work is already helping many everyday folks protect and grow their wealth. And I’m confident it could help you too. Others have paid me hundreds of thousands of dollars for my advisory services. Rickards’ Strategic Intelligence is not going to cost anywhere near that. I’ll give you more details in a moment. What if you could own gold with a “safety net”? That is, what if you could own both sides of the gold trade? On the one side, you’re covered even if gold tanks for the next 18 months. On the other, you could make up to 1,286% if it goes up. My team has discovered a unique trade that allows you to do just that. To be clear, it’s not for everybody. And I call it a “safety net” because you’ve got a chance to see gains regardless of whether gold goes up or down. It doesn’t mean it’s risk-free. No investment is guaranteed. However, we put this strategy through the paces on a dozen more likely scenarios. The potential profit ranges from nice to obscene. Including how you could see between 133% and 289% on the lower end… or sit tight for extraordinary gains as high as 1,286%. And that’s if gold soars to only half of what I predict. If gold hits $10,000 an ounce, as I expect… you could pocket an even bigger return. I’ve prepared another very special bonus gift for you. Every month, I’ll hold an exclusive call to talk about the biggest moneymaking opportunities in the market. I can’t give personalized investment advice, but you’ll hear my best ideas. You’ll even get to submit questions to me for this live moderated event. When is the best time to buy gold? Will we see inflation or deflation? Are we in a stock market bubble? Where should you be parking your cash right now? These are just some of the topics I address on the call. Other companies have paid me $15,000 or more to speak at investment conferences. But once you take a risk-free trial to Rickards’ Strategic Intelligence, you’ll gain FREE access to these calls. 12 issues of Rickards’ Strategic Intelligence. This is the ONLY place where I’ll publish my ongoing intelligence analysis. 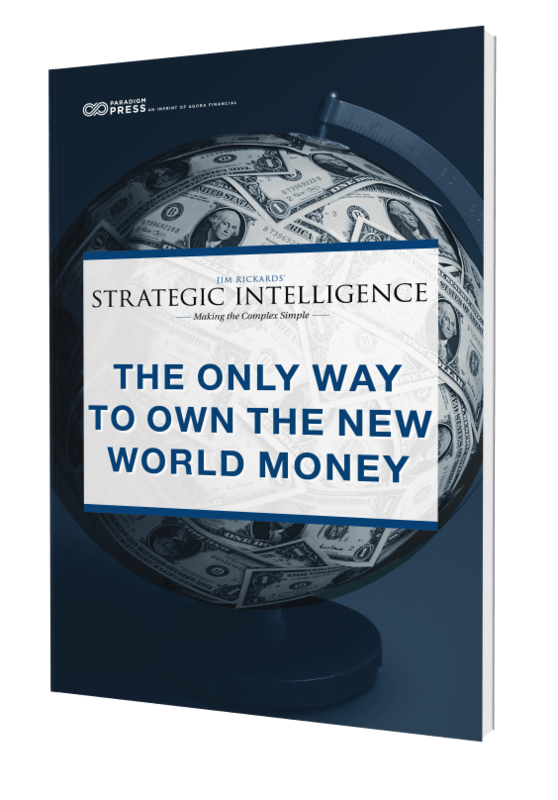 Intelligence Briefing: The Only Way to Own the New World Money. Discover the only way for private citizens to get access to this new currency… before it goes live. Intelligence Briefing: How to Turn $10,000 Into a $193,500 Fortune. 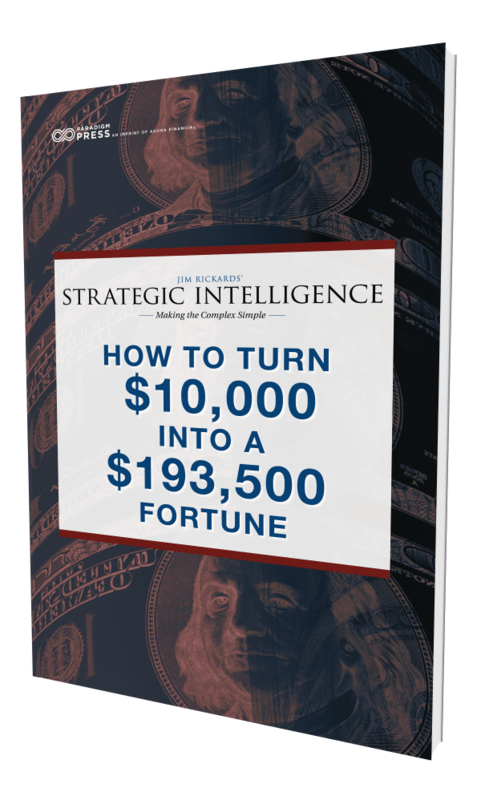 Intelligence Briefing: How to Get $1,000 or More a Month... Regardless of What Happens to Social Security. 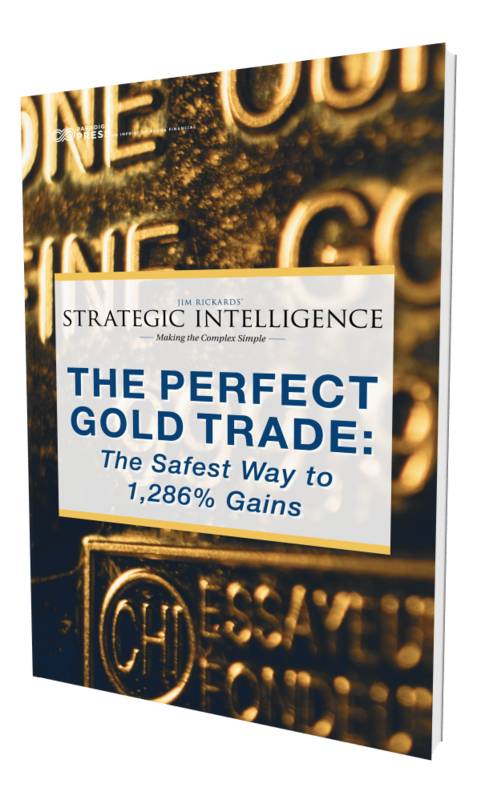 Bonus Intelligence Briefing: The Perfect Gold Trade: The Safest Way to 1,286% Gains. Access to LIVE Monthly Calls. Private Access to Our Members-Only Website, where you get unlimited access to all of our special report archives. 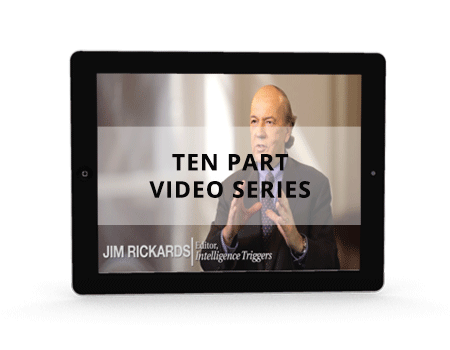 Welcome to Strategic Intelligence 10-part Video Series. Which is why I asked my publisher to cut the price to the absolute bare minimum… enough just to cover the cost of the publication. He agreed to knock off $50 from the regular price. That means a full year's subscription of Rickards’ Strategic Intelligence will cost only $49. That’s just 14 cents a day! We also want you to be 100% satisfied with your membership. When you sign up for Rickards’ Strategic Intelligence, we'll give you a full year to test out the service — at no risk to you. During that year, you’ll get 12 new issues — one a month — each packed with ideas and strategies that will help you protect and grow your wealth. You can keep all the intelligence briefings. You can keep everything. This means there’s no risk to you at all. It's our way of saying thank you for giving Rickards’ Strategic Intelligence a try. And because of that, you only have a small window to secure a comfortable retirement. That means you have zero risk in joining us. And I look forward to welcoming you to Rickards’ Strategic Intelligence in the next few minutes. P.S. The way I see it, you only have two options. Just ignore all the FACTS I just revealed. And let someone else claim all your free gifts. Or you could let me show you what to do right now… while you still have time. I’ll rush you everything… so you can start protecting and growing your wealth immediately. That includes your first trial issues, your instant market updates and all the other moneymaking research we talked about. That way you’re ready now… instead of wishing you’d taken action down the road. Because once your window of best opportunity closes on June 30th, it will be too late to act.